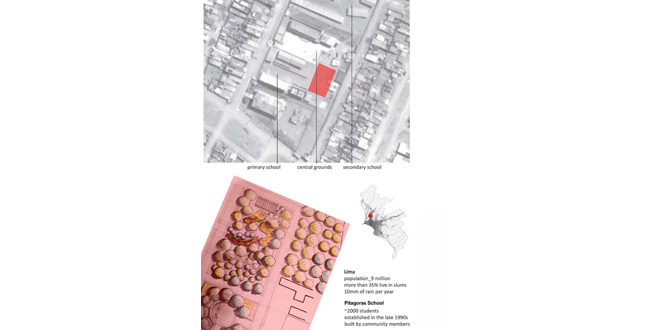 Sited at the Pitagoras School in Lomas de Zapallal (LdZ), an urban slum in northern Lima, the Praque Primaria Pitagoras integrates design activism, interdisciplinary research and education. 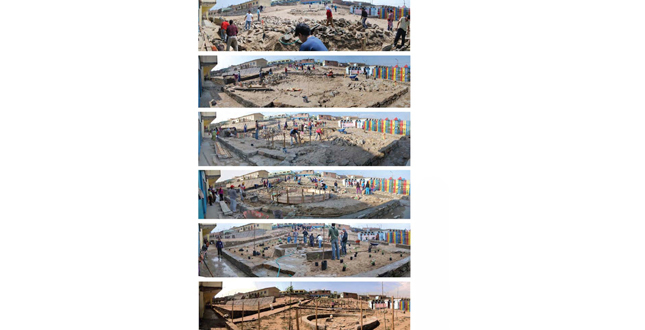 Itinvolves the design and implementation of ecologically intelligent interventions in community infrastructure, related capacity building programs and the monitoring and evaluation of their environmental, economic and human health impacts. 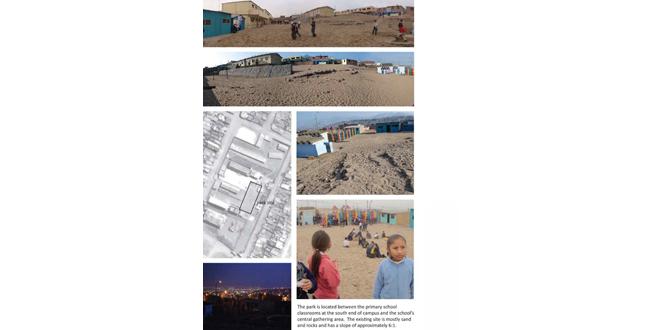 In Lima, Peru more than a third of the city’s 9 million occupants live in slums. 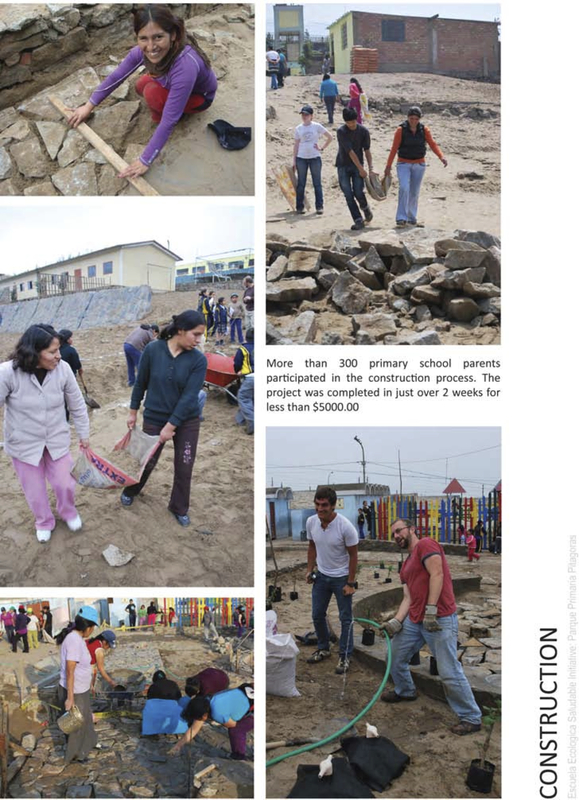 Within as little as a decade, the city’s glacial water supplies will disappear and, receiving less than 10mm of rain a year, Lima will face a water crisis. Changing temperatures and precipitation in Peru’s agricultural regions will decrease agricultural productivity, increase urban food insecurity, undermine rural livelihoods and contribute to increasing urbanization. By 2050 Lima’s population is expected to increase to 16 million. 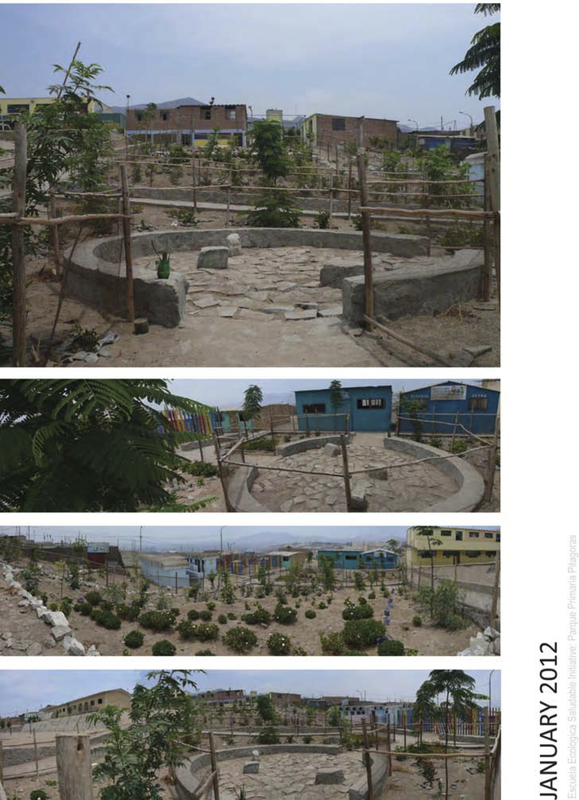 Rapid informal urban growth will exacerbate water and food shortages and infringe upon the region’s few remaining ecologically resilient landscapes. 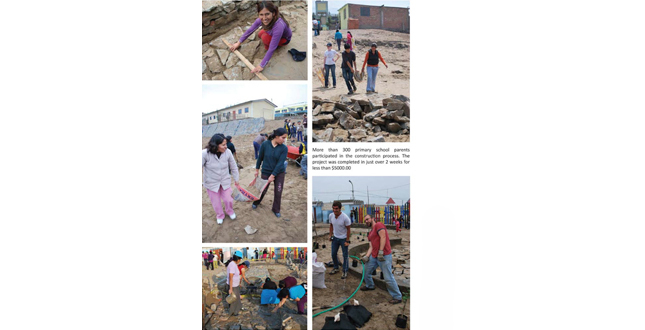 The hardships that Lima’s slum dwellers face will become increasingly acute. 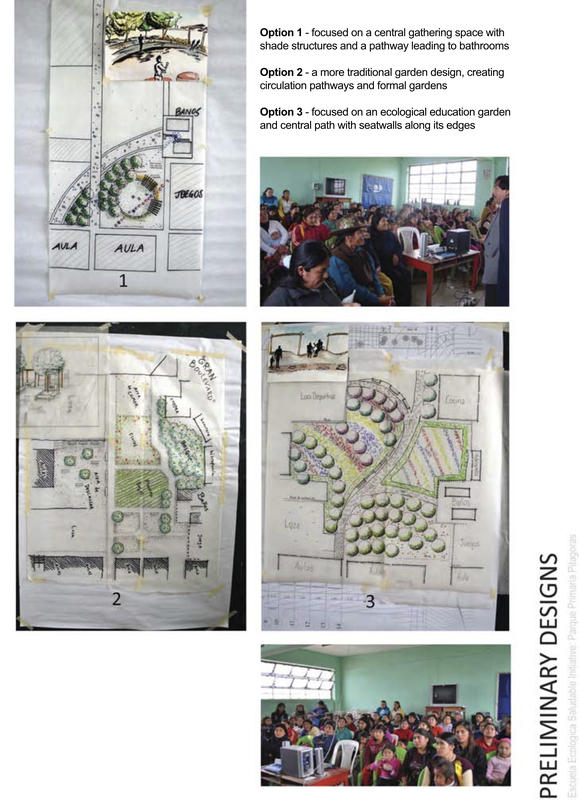 Leveraging a year of community-based research, professors in landscape architecture and forest sciences travelled to LdZ in August of 2011 with 8 university students studying landscape architecture, engineering, environmental science and public health. 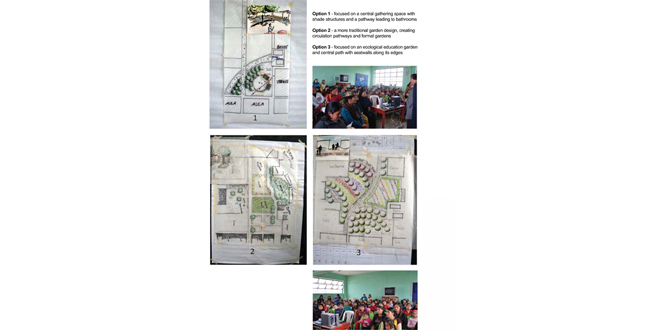 Working in close collaboration with parents, teachers, and children during four participatory workshops, they developed a design for a 600m2 park at the Pitagoras primary school; the Parque Primaria Pitagoras. 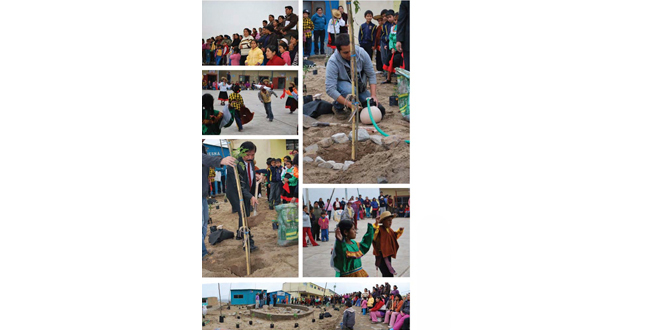 The park’s design provides access between the school’s central gathering area and the primary school, green space in an otherwise barren desert landscape. 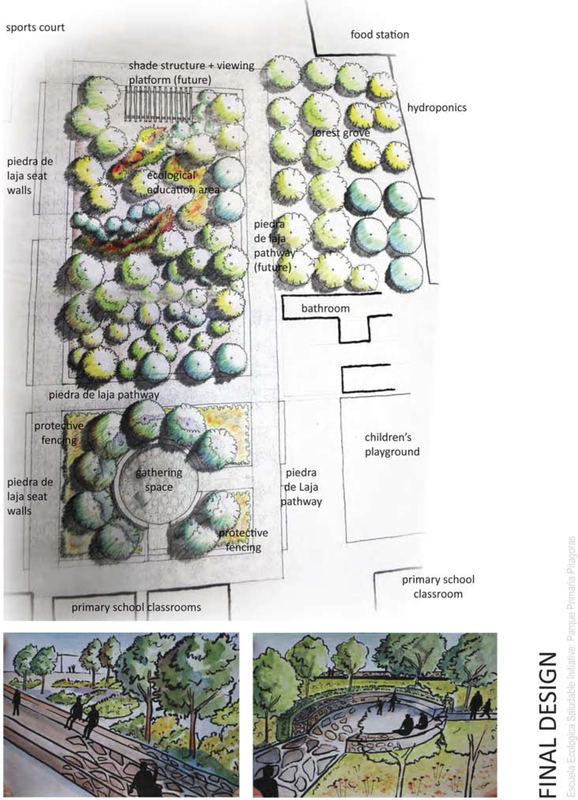 It includes a shaded seating area for outdoor classes, relaxation, and play, and an ecological learning landscape with over 200 native, drought tolerant, economically productive and/or ornamental trees and shrubs. 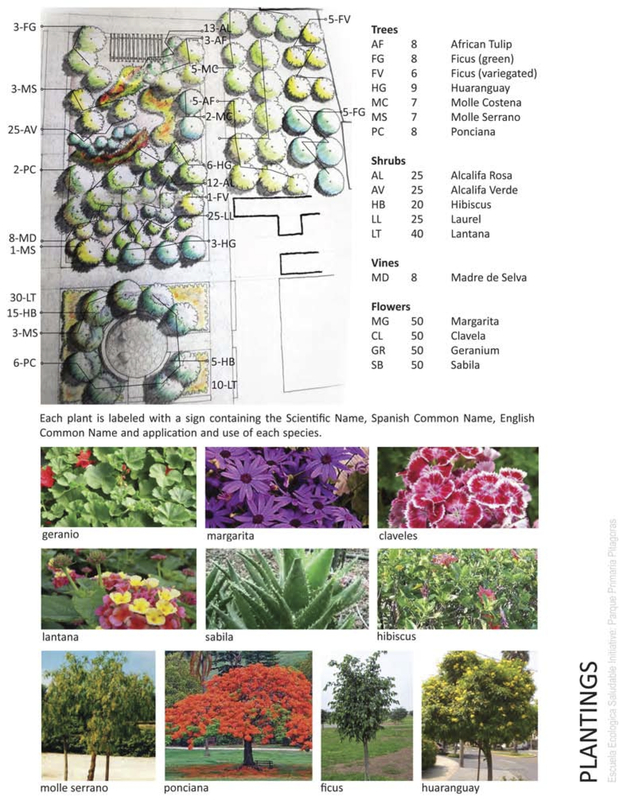 It incorporates a durable, low cost building system, ‘piedra de laja’, which draws upon the skills of local craftspeople, utilizes locally-mined stone and is easy to maintain. 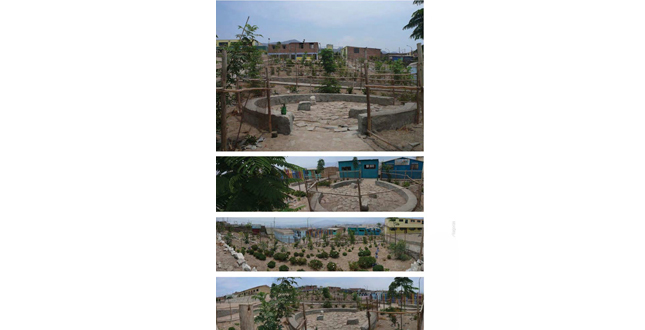 It also incorporates two water-saving irrigation systems that address Lima’s looming water crisis; a drip irrigation system and greywater recycling system that redirects water from a hand-washing station through a sand filter and into a series of porous ceramic vessels that slowly release it into the park. 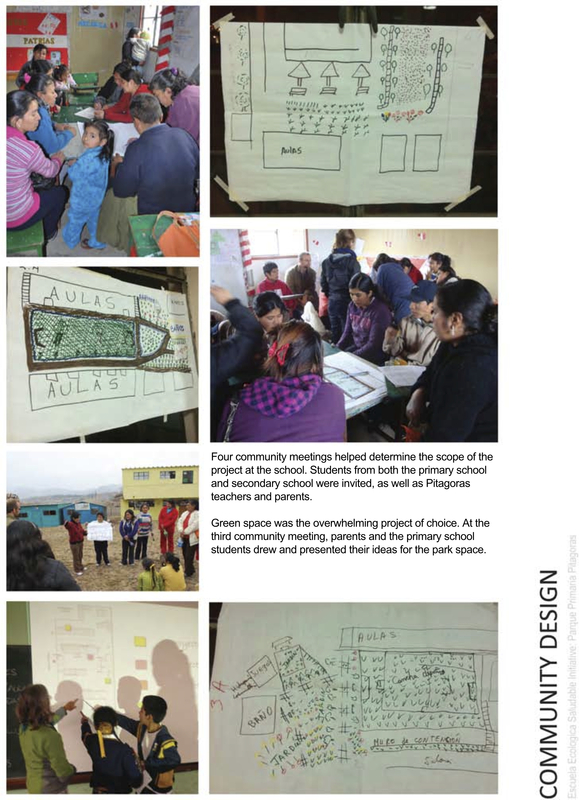 Design implementation relied heavily upon community investment and served as a platform for community mobilization. Well over 300 parents participated. 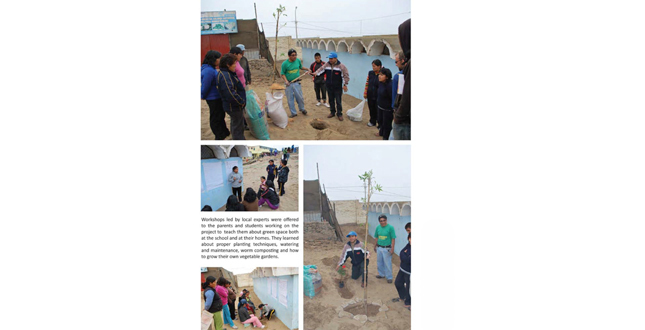 They worked alongside university students to grade the site, lay pathways, plant trees and install irrigation systems. 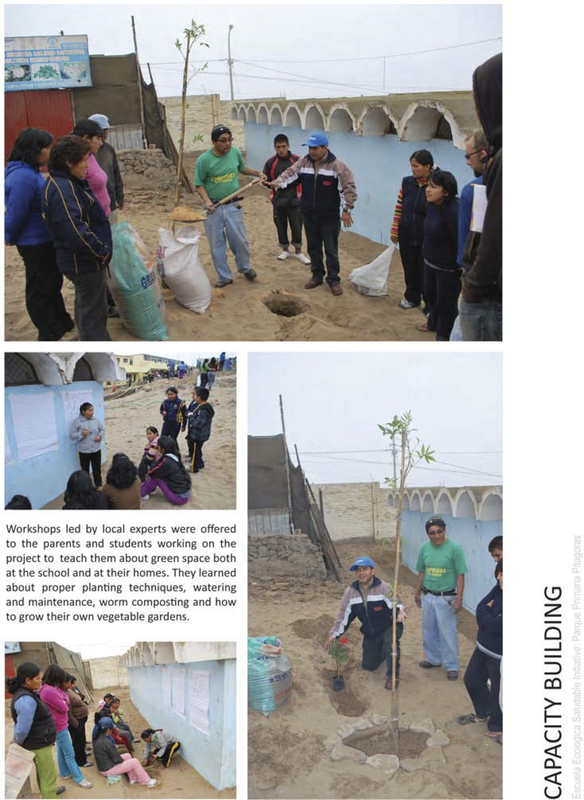 Worm composting, vegetable gardening and tree planting workshops were held during construction to promote urban agriculture and forestation throughout the community. Following the departure of the university students, community participants finished the park on their own. They constructed temporary fences to protect the park’s trees and, using left over stone, marked the future location of paths that were beyond the project budget. All told, the park was constructed in just over 2 weeks for under $5000. 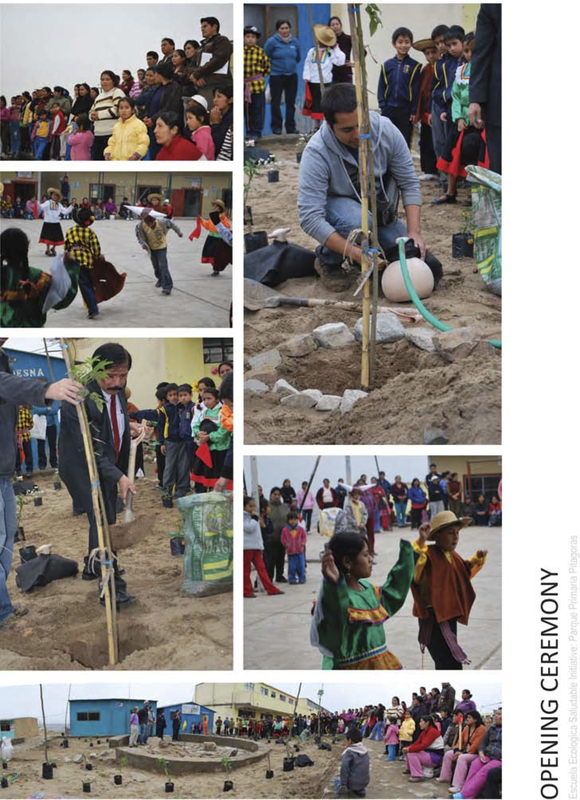 The Parque Primaria Pitagoras may also provide a number of long-term economic benefits. 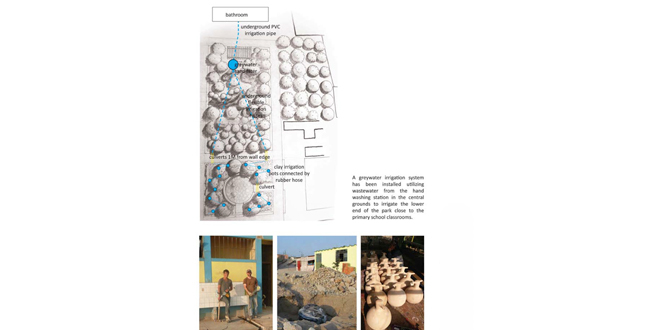 The locally available, low cost materials used to construct the project serve as an example of an affordable building system parents can deploy in their own homes. 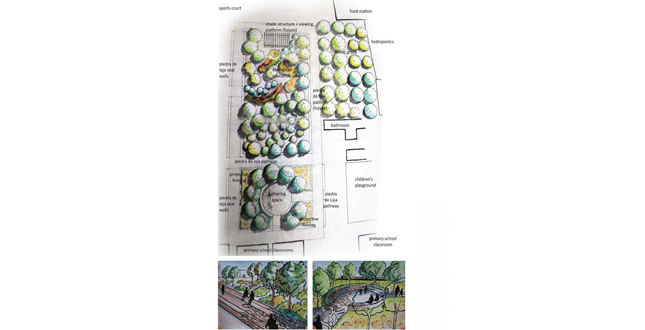 Productive tree species planted in the park teach students the value of forest products and could serve as the foundation for urban agroforestry industries throughout LdZ. 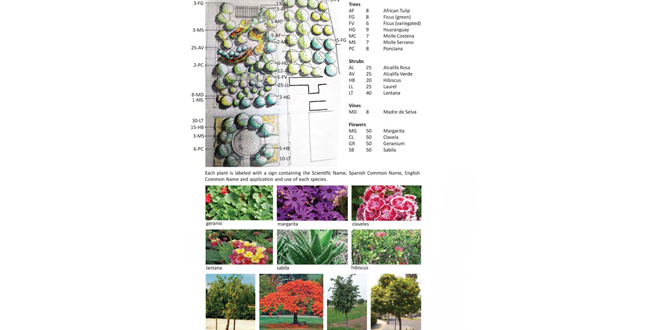 Native, drought tolerant trees included in the park's design teach students about local ecosystems and could serve as a foundation for reforestation efforts in the hills beyond the community, the reestablishment of long degraded native ecological systems and the growth of an eco-tourism industry. It should also be noted, that this project proved to be a rich learning experience for all of the students and faculty involved. In many ways they may have benefitted more than their counterparts in Peru. They gained first-hand knowledge of the issues facing more than 1 billion people in urban slums worldwide. 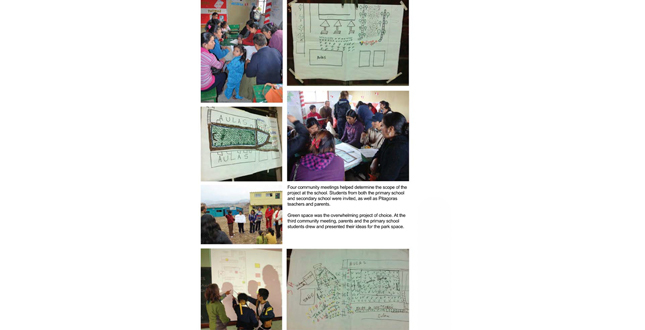 They were involved in a comprehensive cycle of project initiation, design and implementation and acquired skills in cross cultural collaboration, direct community engagement and non-linear participatory processes. They also had the opportunity to engage in interdisciplinary learning, integrating diverse subjects including health, ecology and the built environment and vertical learning/mentoring between graduates and undergraduates. Many of them remarked in their post-course evaluations that their experiences in Lima had reshaped their views of the world. 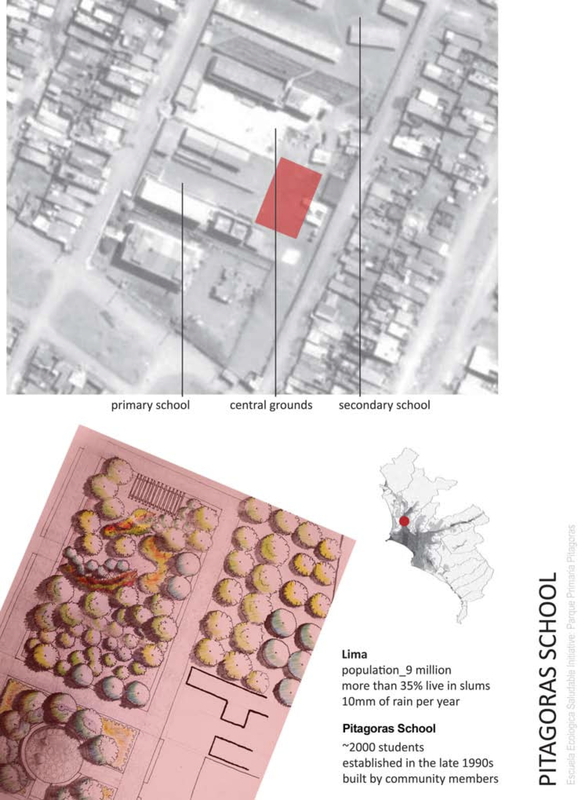 Since the project was completed in September, we have maintained contact with key members of the school community, and our on-site coordinator. By all accounts, the park’s vegetation is prospering and, with the exception of two cracked irrigation pots, its built infrastructure has been well maintained. 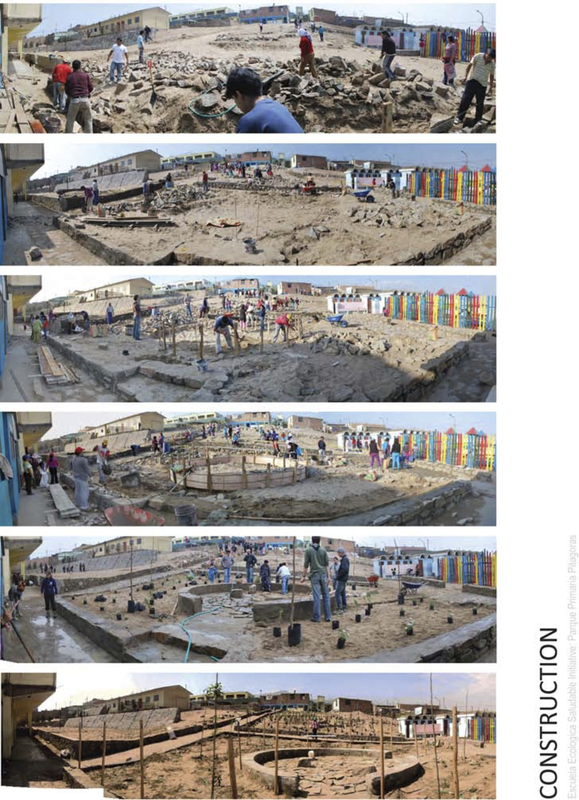 The Parque Primaria Pitagoras project is one piece of an ongoing project that continues to unfold. 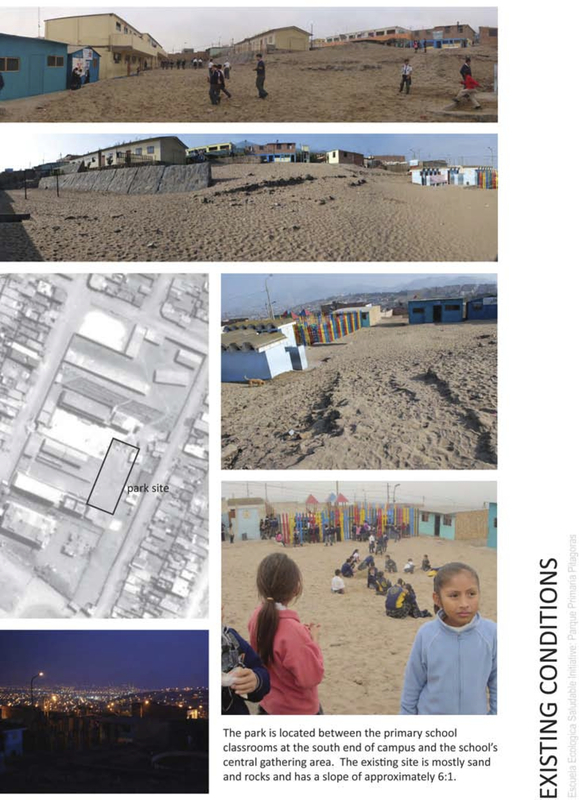 The lessons we glean from it will inform future interventions at the Pitagoras School and throughout LdZ. The professors will be returning to LdZ both on their own and with a new group of students this coming summer to conduct a quantitative assessment of the park’s performance (i.e. 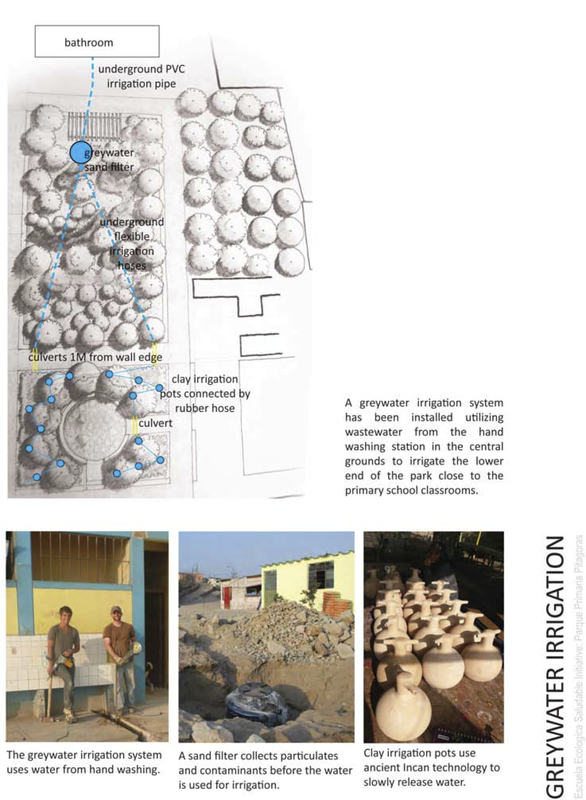 irrigation system functionality, plant growth and survival) and qualitative evaluations of teacher, student and parent perceptions of the park’s social, environmental and economic impacts.